Phat Water only uses trained installers to install our products into your home or office or work place. All of our installers have been put through rigorous training so you can rest assured, when we install our units into your home, work, or office you're having a professional do the job. Because Phat Water is based in WA and we distribute only from WA to the rest of the world, our fully qualified installers are only located here in WA. Should you be located on the East Coast and purchase our products and need an installation, only use a qualified plumber who has installed a Reverse Osmosis unit before, some will have done so, many won't. So shop around, we have heard horror stories of so called qualified plumbers trying to install our units with disastrous consequences, our instructions are straight forward, the average person can install these units so long as they use logic and follow prompts. So how do you know if you can install one of our Reverse Osmosis Units.? Simple: - 1) Do you have a dishwasher in your kitchen.? If so, then it will more than likely have it's own tap under your sink, if this is the case, you simply attach the Adaptor to the dishwasher connection and the dishwasher hose, then connect up all the other attachments. Installation from start to finish will take around 2 hours by a novice, or our installers can have it done in around 1 hour. Attaching our 4 or 8 Stage Shower Filters: This is the easiest of the lot, all you need is a wrench, a crescent, shifter, no matter where you're located in Australia one of these terms ring true to the tool you need, you also need a little Teflon tape or Plumbers tape this is the same thing. 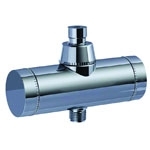 Simply attach the filter to the pipe jutting out of your wall for fixed armed showers,. then attach the the shower arm and your away, making sure you do not over tighten the end caps, or the T ring. If you have a hose shower, then remove the hose from the round connector on the wall, connect the shower filter in it's place, then attach the hose beneath the shower filter, and you're all done. Installation takes around 2 minutes. We will be giving tips on how to get longer life from your shower filters soon. 2) Like any professional a call out fee is applied, in the event you get us out to install a unit, and for whatever reason that installation cannot take place, then the fee is forfeited. Please understand, installers are on the job nearly 7 days a week, so time is precious, so always make sure you are home at around if not earlier than the time you request for an installer, if not, then unfortunately if our installer turns up to your office, work, or home and no one is there to see the work done, then you will lose your fee.